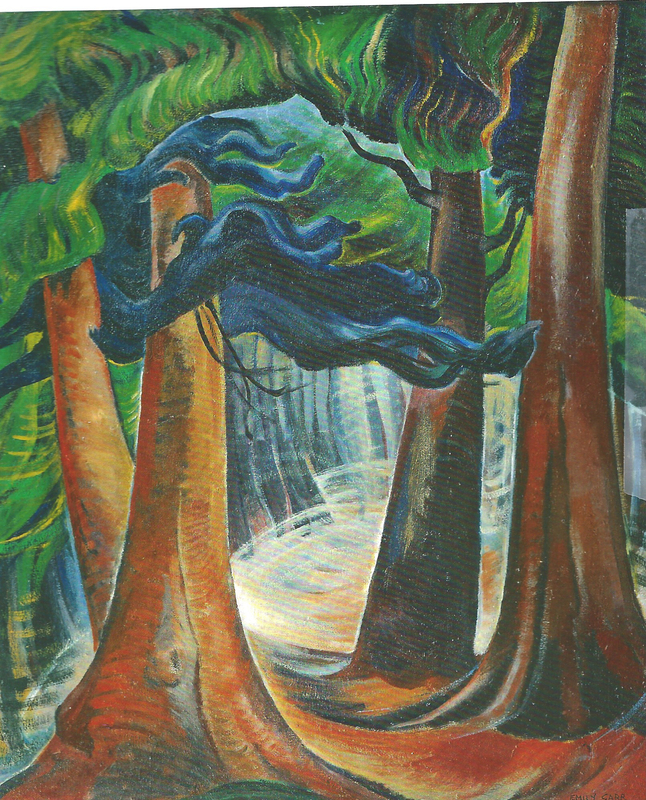 June introduced me to Emily Carr back when she and I were having a little challenge – painter and fiber artist creating original works, then riffing off each other. I work with trees a lot so of course was intrigued by Carr’s interpretations, but it was her skies that really fascinated me. “Above the Gravel Pit”, “Big Eagle, Skidgate BC”, “Big Raven”, “Kilwancool”, and “Vanquished” are examples of painted skies like I had not considered, that I could piece into my fiber rendition between my trees. Like the rest of you, I’d love to see her work in person, really study it. It has a rhythm all its own. Carr’s personal history is worth pursuing — in her late teens, she studied art, much to the dismay of her family, in San Francisco and then in England and France. She had a work admitted to a major Paris exhibit, and painted, at one phase of her career, in a post-impressionist manner, as well as engaging in some Fauvist and Cubist mannerisms. She suffered what might be called a nervous breakdown while studying, in her early 20s, in England, and went back to Victoria. In Victoria, she dismayed many by documenting (that was her intent, rather than “making art”) the art of the Canadian Northwest Coast Indians, traveling up and down the island of Vancouver, and making friends with the indigenous peoples around Victoria. She spent a lot of lonely time in her 30s and 40s, doing little craft objects, trying without much success (“not realistic enough”) to exhibit, and running a boarding house while dealing with a rather difficult family. When, at age 56, she met with the Group of Seven in Ottawa and Toronto, particularly Lawren Harris, she blossomed into the Emily Carr whose fame has been rightly celebrated. She also wrote a bunch of autobiographical books, which are funny and a bit self-dramatizing. She spent summers parked in in a “van” in the woods with her dogs, a monkey, a pet rat, and her art materials, painting furiously. She worked in watercolor and made amazing charcoal drawings (I couldn’t get myself away from them when I saw them) as well as the oil paintings; she stopped “documenting” the indigenous art and turned her paintings reflecting the native island art and forests into her own voice. My real regret in thinking about and looking at Carr’s work over the last few years is that I haven’t had a chance to study her work up close and personal since I’ve been a serious painter. So I feel I’ve missed much of what I could have gained. I’ve looked at reproductions, of course, and own most of her own writings and the major books about her art. But nothing can match looking at the real thing. I did that early on; I want to do it again. Thanks, Clairan, for bringing her to my attention. Again. Thanks for this! 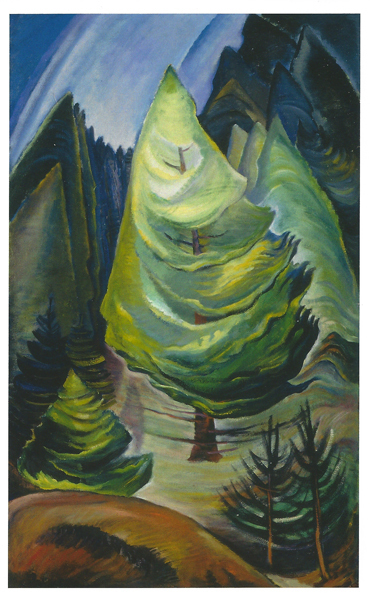 Emily Carr should be far better known outside Canada. I believe the largest collections of her work are in the Vancouver Art Gallery, the Art Gallery of Greater Victoria (her home town) and the National Gallery of Canada (in Ottawa). I’ve seen her amazing work in the first two places but not in Ottawa, yet. We visited some of the areas of the First Nations that she had visited and painted, so beautiful – one can see why she was so inspired by the nature and the people. Thank you, Clairan. Lovely quote I’m copying in to my studio notebook. Thanks Virginia. She is admirable! There really is too little time in one life to read about all the folks whose work attracts! Emily Carr’s art at first glance on this blog in 2007 https://raggedclothcafe.com/2007/03/18/emily-carr-canadian-artist/#more-120 reminded me of the art of Franz Marc http://en.wikipedia.org/wiki/Franz_Marc and the Blaue Reiter goup of painters http://en.wikipedia.org/wiki/Der_Blaue_Reiter. But on looking I see that she very much has her own particular voice. The brief description on the National Gallery of Canada site is interesting http://www.gallery.ca/en/see/collections/artist.php?iartistid=915 – and I certainly very much like the look of her from the photo there! I have not read any of the books mentioned, but am fascinated by Carr’s desire to change attitudes to the native peoples by painting totems and the landscape. From the look of the paintings she was a passionate lover of her environment as well as of her materials. And I certainly agree wholeheartedly with her riposte that art should provide an observer with more than their eye ordinarily sees. Like you, Clairan, I was apprehensive the first time I took a drawing class as an adult. I not only did not believe I could reproduce acceptably what was in front of me, but also I knew that I did not want to make simple accurate reproductions – that’s what record making with a camera is for! But I was lucky in that first lesson taught me blind drawing – really looking at the subject, not looking at the drawing, and not lifting my pencil from the paper till complete – and I have never felt cowed again. It would be good to see the work of Emily Carr for real, and even better to be able to visit the landscape and subjects she painted. But thank you for reminding me of her as an artist, and giving me the opportunity to look and think again. I am particularly intrigued by the mention in the National Gallery of Canada’s biography that she studied in St Ives at the end of the nineteenth century, and shall follow that up to satisfy my curiosity. I had never hear of this artist until I read The Tree Lover. I loves the book and after reading it looked her up. Her work is amazing. This book also made me add that area of BC to my bucked list.